This paper presents a new direct method for estimating the average center of rotation (CoR). An existing least-squares (LS) solution has been shown by previous works to have reduced accuracy for data with small range of motion (RoM). Alternative methods proposed to improve the CoR estimation use iterative algorithms. However, in this paper we show that with a carefully chosen normalization scheme, constrained least-squares solutions can perform as well as iterative approaches, even for challenging problems with significant noise and small RoM. In particular, enforcing the normalization constraint avoids poor fits near plane singularities that can affect the existing LS method. Our formulation has an exact solution, accounts for multiple markers simultaneously, and does not depend on manually-adjusted parameters. Simulation tests compare the method to four published CoR estimation techniques. The results show that the new approach has the accuracy of the iterative methods as well as the short computation time and repeatability of a least-squares solution. 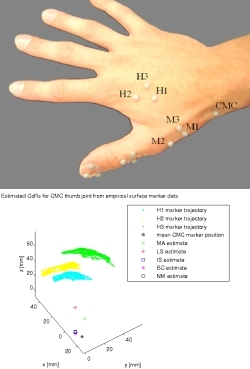 In addition, application of the new method to experimental motion capture data of the thumb carpometacarpal (CMC) joint yielded a more plausible CoR location compared to the previously reported LS solution and required less time than all four alternative techniques. Lillian Y. Chang, Nancy S. Pollard (2007). Constrained Least-squares Optimization for Robust Estimation of Center of Rotation. Journal of Biomechanics, 40(6), 1392--1400.